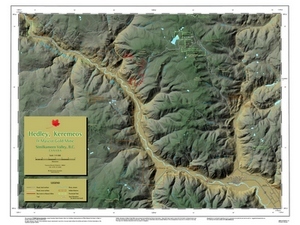 Hedley, Keremeos & Mascot Gold Mine is a full-colour topographic map of the upper Similkameen valley, British Columbia. Covering the region from Bromley Rock Provincial Park in the northwest to Cawston, BC. in the southeast, the map is centred on Hedley, BC, and the Mascot Gold Mine. This 1:75000-scale map is 18"x24" in size and is an excellent reference for any visitor to the Mascot Mine and its stunning views of the Upper Similkameen valley! Peruse the map using the MapZoomer! Click map image to launch!